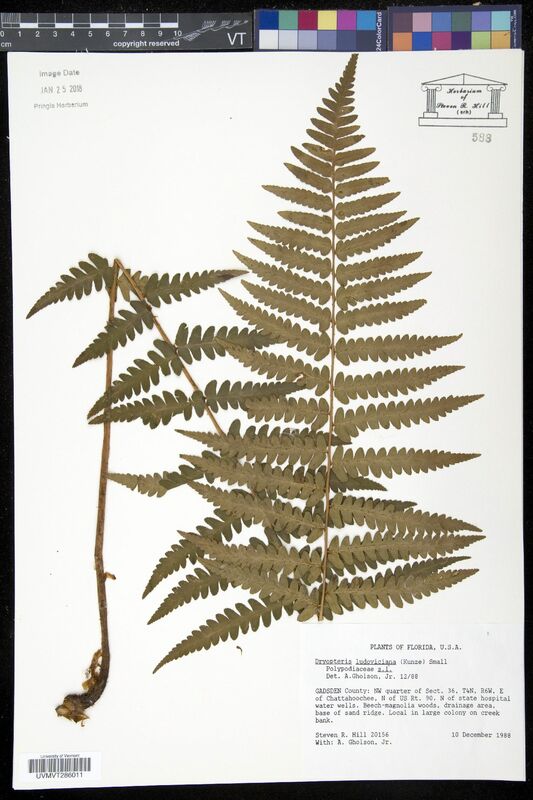 Leaves somewhat dimorphic, green through winter, 35--120 × 10--30 cm. Petiole more than 1/4 length of leaf, scaly at base; scales scattered, brown. Blade dark green, lanceolate, pinnate-pinnatifid, herbaceous, not glandular. Pinnae nearly in plane of blade, lance-oblong; fertile pinnae in distal 1/2 of leaf, distinctly narrower than proximal vegetative pinnae (only in this species); basal pinnae lanceolate-oblong, much reduced, basal pinnules slightly shorter than adjacent pinnules, basal basiscopic pinnule slightly longer than basal acroscopic pinnule; pinnule margins distantly serrate. Sori midway between midvein and margin of segments. Indusia lacking glands. 2 n = 82. 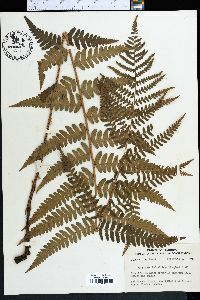 Swamps and wet woods; 0--100 m; Ala., Ark., Fla., Ga., La., N.C., S.C. Dryopteris ludoviciana is endemic to southeastern United States. This diploid is one of the parents of D . celsa and D . cristata . It crosses with D . celsa to produce sterile hybrids.